Welcome to my cookbook Cookerypoint - Ila's Kitchen. I would like to thank Charitha of WomensEra2008 to provide me a chance to guest host her ARS Event. Alaphabet Recipe Series comprising of alaphabet from A-Z. 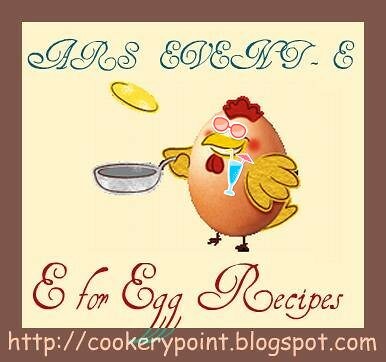 I am guest hosting the alphabet E for Egg Recipes. Hoooooola hope its tempting and easy event to give your infinite entries. I am looking forward to your entries to make this event grand suceess. Eggs Recipes are the easiest one to cook. This add protien and other nutrients to our diet. Eggs can be used in different forms such as scrambled,fried,hard boiled, baked and poached. There are many varieties of egg dishes especially from different cuisine such as Kerala, Tamil nadu, Andhra,Goa and many other which includes the recipes such as Chettinadu egg curry, Egg Tikka and thokku. There are many egg recipes which reprents their own regional cuisine which can be served as appetizers,maincourse and desserts. So, numerous entries are expected from your kitchen guys. Entries are welcome and appreciated as well. Eggs are manditory as the E for Egg is our event. Non- veg recipes are not allowed as the blog is completely vegetarian one. Combination of vegetables can be used with eggs and regional variety recipes are welcome. Please do avoid Cakes as eggs plays only supportive role in baking. The entries can be either from Starters, Maincourse and desserts. Two entries are allowed per blogger/Non blogger. Recipes from International Cuisine are always welcome. Please use the logo in your post and do link your page to this announcement page which helps to spread some words about the event. New entries are appreciated and archived entries are accepted,if they are reposted with link and logo. Please do email the following details of your entry with subject as "E for Egg Recipes" to cookerypoint.ilakitchen@gmail.com till Sep 5 th 2011. Non- bloggers are always welcome and send your entire recipe with picture to cookerypoint.ilakitchen@gmail.com till Sep 5 th 2011. I am looking forward to your tempting and delicious entries as there are wide variety of recipes and choices. wonderful event dear...shall send some recipes..
Nice event!! Happy Hosting!! Will send my entry soon. Lovely choice Ila... would try to send in some..
Nice event and easy ingredient. Happy hosting!!! First time here. I'll send my entry soon. Nice theme and happy hosting dear! Sounds like a wonderful event, will see if I can come up with something. Cheers!